This solar auto darkening welding goggle features anti-ultraviolet, infrared radiation, anti-glare. Auto-darkening filter automatically changes from a light state to a dark state when an arc is struck, and it returns to the light state when welding stops. Wide applicable: gas welding, steel welding, cutting, welding and so on. 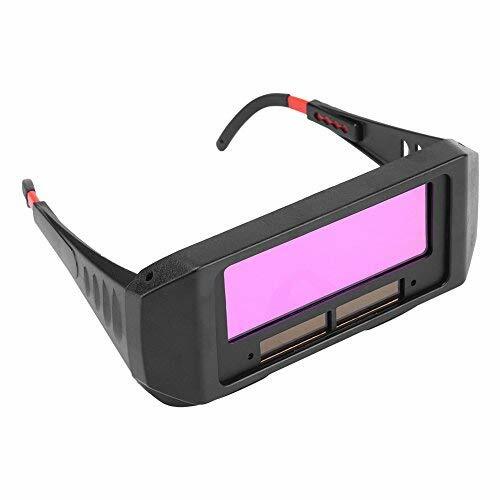 This solar auto darkening welding goggle features anti-ultraviolet, infrared radiation, anti-glare. The welding goggles with adjustable shade are designed to protect the eyes from sparks, and harmful radiation under normal welding conditions. Auto-darkening filter automatically changes from a light state to a dark state when an arc is struck, and it returns to the light state when welding stops. Solar cells, no battery change required. Easy and safety to operate, light weight design. Goggles frames can be adjustable. Automatic variable light lenses lightweight and convenient, with superior impact resistance, the use of more secure and assured. Applicable to: gas welding, steel welding, cutting, welding and so on.